Location: Facing the NE corner of Caerphilly Castle, fronting Castle Street with Bedwas Road to the rear. Built in 1924 as hall and institute. Hall on 1st floor entered from main entrance. The institute was on the ground floor, entered from rear, and included snooker room and library on the 1st floor. The building was financed largely by the subscriptions of local workers, mainly miners. Large auditorium with main entrance block facing W, and rear entrance block now leading to gymnasium. Red-brown brick, artificial slate roof. Two-storey, 4-window main entrance block in simple Classical style with parapet. Articulated by full-height brick pilasters to angles and flanking entrance which are banded to ground floor. Recessed Doric porch with 2 columns supporting entablature with inscription 'Caerphilly Workmen's' Hall'. Doorway with metal shutter. The flanking ground and 1st floor windows have blank panels beneath. The ground floor windows have gauged brick heads, and the foundation stones were laid below on 5 April 1924. The windows contain late C20 UPVC glazing. A frieze at high level is made up of individual letters and reads 'Workmens Hall'. The S side has an entrance to L beneath porch on brick pillars. The auditorium block has a pitched roof and runs at a slight angle to the main entrance block. The sides are 6-window, divided by pilaster strips. All the windows are blocked with brick. The L bay of the S side is now occupied by a fire-escape with cross-window below. The roof has a lantern ventilator. The rear entrance block is similar in style to the front entrance block: 2-storey, 4-window, with pilasters to angles and flanking central paired windows, and banded plinth. First floor windows have original metal frame glazing. Doorway to L in casing with flat cornice supported on brackets, containing double panelled doors with overlight. The ground floor windows are all blocked with red brick. There is a foundation stone below the R window opening. 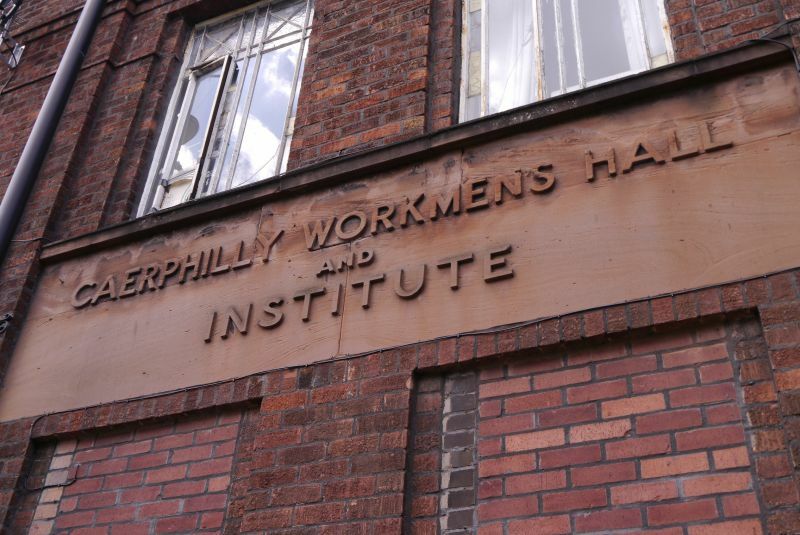 At 1st floor level between the pilasters is a concrete panel with 'Caerphilly Workmens Hall and Institute' in relief. The N side of this block is divided into 3 bays by brick pilasters, with blocked window openings below, and small casement windows above with quarries, to light the library. Octagonal lobby has walls of green tiles with black-and-white banding, cornice with Greek key frieze, round arches to auditorium, that to R has stairs to balcony (wooden panelling to sides). Classical-style auditorium has broad segmental arched ceiling, Greek key pattern to ribs, and moulded cornice. Lower flat ceiling to stage, but segmental arch above stage front has a decorative panel, and frieze of overlapping discs. To the sides is a frieze of alternating grilles and decorative panels with bunches of fruit. Beneath, broad Doric pilasters alternate with shuttered windows. To rear, deeply curving balcony front has banding with Greek key pattern and wreaths. Rear entrance has lobby with glazed tiles, with door to R to gymnasium. Said to have stairs with boarded dado, leading to first floor library with wooden lecterns for newspapers. Listed for its social-historic interest for this industrial community, and for its largely complete and unaltered interior.